For thou hast done wonderful things; Thy counsels of old are Faithfulness and TRUTH. We encourage the sincere and honest ones, sensing the demands of the hour, to subscribe for this free monthly publication, stating clearly their addresses. Given the Newsletter is free, subscription fee is the exact cost of postage (stamp and envelope) by Uganda post office; and these are the postage fees stated per year: Uganda sh.10,800, Kenya sh.900, Tanzania sh.14,200 and Rwanda F.10,800. All payment by cash should be posted to our address. However, a sincere person of God who cannot afford the postage fee, please write to us stating the fact, so by the Lord’s providence you may be added to the list of the poor for us to continue sending you this publication. The unity of the church of Christ is clearly revealed in the New Testament. Though there is great variety in ability, naturally or acquired, yet the least as well as the greatest is a member of the Body, and all alike are vitally connected with Christ the Head. The figures used in the Bible all illustrate this unity, and, we may add, indivisibility. “One fold and one Shepherd,” John 10:16. The vine and the branches, John 15:1-4. The temple and living stones, built on one foundation, Eph. 2:20-22, and One City, as “the bride, the Lamb’s wife,” Rev. 21:9,10. One Body refers to the “One True Church” — Col. 1:24, “Who now rejoice in my sufferings for you, and fill up that which is behind of the afflictions of Christ in my flesh for his body’s sake, which is the church.” Thus the Apostle states clearly that there is only ONE True Church in the Whole earth being established by God through His dear Son Jesus Christ who is also its Head! There is much comfort in the assurance this fact gives to all who have put on Christ. They are all one in Christ Jesus. Gal. 3:26-29. To see and appreciate this unity and indivisibility would destroy sectarianism and endear Christians one to another. Sectarianism began to show itself in Paul’s day and was condemned. “I am of Paul,” and “I of Apollos,” etc., was met by the question, “Is Christ divided? Was Paul crucified for you? or were you baptized in the name of Paul?” 1 Cor. 1:10-13. This is as much as to say: As Christ is not divided, ye should recognize no divisions, and call yourselves by no name but Christ. If it was contrary to the spirit of Christianity then, to say I am of Paul, or I am of Apollos, or I am of Peter, what can be said to justify men now in calling themselves “Calvinists,” “Armenians,” “Lutherans,” “Wesleyans,” or by any man-made name? If Paul were writing to the churches of the nineteenth century (was he not? ), would he not call such things carnal, as when he wrote to Corinth? 1 Cor. 3:1-5. NOW there is this new issue of various churches each calling themselves part of the body, the One True Church! Common among men here are Catholicism, Anglican, Full Gospel, Seventh Day, Pentecostal, Life Line Ministries, PAG, …. so many names. NOTED clearly is that each of these organized systems has its own Faith deferring from another, varying methods of Baptism, deferring doctrines or Spirit, of cause with various understandings of the One Lord and One God! We shall endeavor to show that this is contrary to the Apostle’s characterization of the one true Church in Eph. 4:2-6 as well as the one our Lord Jesus began. However, there might be a few individuals in these systems who are Believers but are greatly blocked from joining or recognizing the “Gate” to the True Church, and hence at best they remain Believers but not Members of the body! We shall consider one aspect of Eph. 4:2-6 — “One Hope of Our Calling” — showing that the True Body/Church has one hope as given them by God and through His Son Jesus Christ and it is different from the hope of many of these so-called churches/systems above, hence making them different from that which the Lord owns as his Body! As the faith of the Catholic church is different from that of Seventh Day, and also Baptism differs from that of Pentecostals even the Spirit, we ASK what about the Hope of their Calling? How different is their Hope from that stated in the Bible and the One true Hope of our Calling? In Eph. 4:4 it states clearly that the True Body, the Church, has “One Hope of your Calling.” We inquire, what is this One Hope? And if any one differs, does this disqualify him or the system from being in the True Church even claiming to be its least Member? What is the Purpose of the calling of the Church? Why is the Church raised? Why did God ordain the raising of a Bride for His dear Son, the second Adam (1 Cor. 15:45)? Can God himself change His mind regarding this Hope? It is evident, therefore, that the Oath of the Righteous is unalterable and no power in the whole Universe can change this as it was made by the Most Holy One! What is the OATH? That through the SEED of Abraham shall all the families (Nations) of the Earth be blessed! Therefore, it is clear that the Purpose or Calling of the Church is to bless the rest of the families of the earth (Humanity who did not have the chance to be part of this seed, the true Church), giving them opportunities for everlasting life. To us the Scriptures clearly teach that the Seed, Christ (head and body), will be Priests of God after their Resurrection and will reign here on the Earth for 1,000 years. We see clearly that after the Union of the Church with her Lord, the Marriage of the Lamb is accomplished, then they together will bless or call others and give them the “Waters of Life freely”! Remember the Other False Calling, that the blessed true members of the Church go to heaven, and the rest who are not qualified automatically go to Hell or Purgatory, hence the earth remains empty and the rest are destroyed. Of course, this hope and calling is by another clever person (deceiver) but not by God, for God has clearly stated the work or purpose of His Church – to bless all the families of earth who are not part of the Church and that will be after Resurrection of all. Look at various churches’ calling: if all unbelievers go to hell, and the Church goes to heaven, then to whom will the true Church teach or bless or give the “waters of life” freely? Will the Church with her Lord give “waters of life” to animals? Will the Church be Priests to goats, leopards, lions, and snakes? Who will they reign over here on the earth as Scriptures state? The True Hope of our Calling is to be partners (Joint-heirs) with Jesus Christ in blessing all the families of the earth during a 1,000 year reign of Messiah, thus being Priests of God here on the earth, giving the “waters of life” to them and bringing everyone to the knowledge of Truth, and perfection! Therefore, we have seen in Scriptures that the One True Church/Body has One Hope of their Calling, hence any other hope is false and proves one has never known nor come to this Body, the Church of the Living God! One can readily see which one is a false Church/system based on this aspect only. Due to the multiplicity of so-called Christian churches today, the LORD foresaw the need to ensure the blessed few with guarantees that our faith should be ironclad, unmovable, and hence He made Oaths accordingly. WHAT CAN YOU DO TO BE SAVED? One fleeing needs to get the Truth on various matters and Bible subjects, hence a diligent search for the Truth. The LORD has designed His Truth for the Sanctification of His People, to be completely sealed in their foreheads and hands. Please take the opportunity offered for a Free Bible Study Course by correspondence, and do not hesitate to contact us. Omubiri Gumu, Omwoyo Omu, Okuyitibwa Kwaffe Kumu, Mukama Omu, Okukkiriza Kumu, Okubatizibwa Kume, ne Katonda Omu. Obumu bw’Ekkanisa bw’ogerwako nnyo mu Ndagano empya mu Baibuli. Ekkisibo kimu n’Omusumba omu (Yokkana 10:16), Omuzabibu n’Amatabi gagwo (Yokkana 15:1-4), Yekkalu emu n’amayinja agazimbibwa ku musingyi gumu (Abbef. 2:20-22), ne Ekibuga kimu era Omugole w’Omwana gw’Endiga. Abaefeso 4:4-6 – “Omubiri guli gumu, n’Omwoyo omu, era nga nammwe bwe mwayitibwa mu kusuubira okumu okw’okuyitibwa kwammwe; Mukama waffe omu, Okukkiriza kumu, Okubatiza kumu, Katonda omu, ayita mu byonna, era ali mu byonna”. Omubiri gumu – ategeeza “Ekkanisa Emu entufu” – Abakkolosaayi 1:24 – “Kaakano nsanyuse mu bibonoobono byange ku lwammwe, era ntuukiriza ebibulako mu kulaba ennaku kwa Kristo mu mubiri gwange olw’omubiri gwe, ye Kkanisa”. Wano Omutume Paulo, akakasa okubaawo kw’Ekkanisa emu mu nsi yonna, nga erina okukkiriza n’okubatiza kumu ! Era gano, mazima era obukakafu eri bonna abayingira mu Kristo – Abaggalatiya 3:26-29. Obumu buno bujjawo engyawukana mu bakkiriza. Engyawukana za tandika edda-- ng’abamu bagamba nti ndi wa Paulo, abalala Apolo – Paulo kw’okubabuza nti Yesu mugabanemu ? Bw’ekityo, bwa omu era nga ye Mukama waffe, tuli omu – 1 Abak.1:10-13. Tulaba ekiriwo kati nga kiringa omutima ogwo Paulo gwe y’agana mu Kkanisa wabula nga kyikyukira ddala, era kibi nnyo! Tulaba nga ebibinja bya manyi nnyo – abamu ba Katoliki, abalala ba ngilikani, abalala ba Seveniside, abalala ba lokole ba Pentikoti, ….. ebibinja bingi nnyo; Ekikulu nti birina abakkiriza abengyawulo – Enzikkiriza zawukkana, okubatiza kwawukana, n’omwoyo ayawuukana, so nga ne Katonda Omu ne Yesu omu babategeera bulala ! Tugenda kuffuba okubalaga nti bino bikontagana ne by’Awandiikibwa mu Abaefeso 4:2-6! Kale amakkanisa mangi galina enzikkiriza zanjawulo, n’okubatiza kwa njawulo, naye tubuza nti zonna ntufu oba eriwa entufu ? Kuba bino bikontana n’Omutume kyagamba mu Abaefeso 4.1-6. Tulaba mu kyawandiikibwa ekyo nga Ekkanisa oba bonna abali mu Kristo balina esuubi mu Okuyitibwa kwabwe kumu. Ekibuzo kili nti zonna ekkanisa ezo zirina okuyitibwa okwogerwako okumu mu baibuli? Bo abakkiriza mu makkanisa ago balina esuubi ly’okuyitibwa okwo ? Mu Abaefeso 4:4, kilabika lwatu nti Ekkanisa emu entufu elina Esuubi limu ely’Okuyitibwa kwabwe era singa tulaba Esuubi ly’okuyitibwa mu Baibuli, ekyo kitumala okwawula abeyita ekkanisa ya Kristo nga si bbo (oba amakkanisa amafu)! Ekibuzo ekisoka – Lwaki Katonda y’ateekawo Ekkanisa ? Omugaso gw’Ekkanisa ng’Omugole wa Yesu ki ? Lwaki Katonda y’ateesa okufunira omutabaniwe (Yesu), omukyala ? Tulaba edda nti Mukama Katonda yakolagana nnyo n’abakadde ba Yisirayiri era n’abawa ebisubizo bingi, era n’okwelayirira mu byo. Ekimu ku byo kye tulaba mu Oluberyeberye 22:15-18. – “Ne malayika wa Mukama n’ayita Ibulayimu omulundi ogw’okubiri nga ayima mu Ggulu, Nayogera nti Nneerayidde nzekka, bw’ayogera Mukama, kubanga okoze bw’otyo, n’otonnyima mwana wo, omwana wo omu: Okukuwa omukisa n’akuwanga omukisa, n’okwongera naakwongerangako ezzadde lyo ng’emmunyenye ez’omu ggulu, ng’omusenyu oguli ku ttale ly’enyanja; era ezzadde lyo balirya omulyango ogw’abalabe baabwe; era mu zzadde lyo amawanga gonna ag’omu nsi mwe galiweerwa omukisa; kubanga owulidde eddoboozi lyange”. Tulaba nti Ekirayiro kino ky’Oyo atula mu butuukirivu era tewali ayinza okukikyusa ku nsi ne mu ggulu! Ekisuubizo kino eky’endagaano, eri Ezadde lya Ibulayimu ky’ekiruwa? Nti “mu Zzadde lya Ibulayimu, Amawanga gonna ag’omu nsi (Abantu) mwe galiweerwa omukisa! Kale Ezzade lya Ibulayimu ly’eririwa ? Omutume Paulo, ategeeza lwatu Ensigo/ Ezzadde lino mu – Abaggalatiya 3:16 – “Ebyasuubizibwa byagambibwa Ibulayimu n’omuzzukulu we. Tayogera nti N’eri abazzukulu, nga bangi, naye ng’omu nti N’eri omuzzukulu wo, ye Kristo”. Ekkanisa egabana wamu nga omubiri ogumu ogwa Kristo – Abaggalatiya 3:27,29 – “Kubanga mwenna abaabatizibwa okuyingira mu Kristo, mwayambala Kristo…. Era mmwe bwe muli aba Kristo, kale muli Zzadde lya Ibulayimu, era muli basika ng’okusubiza bwe kwali”. Kyeraga lwatu nti Ekigendererwa ky’Ekkanisa oba omugaso gwayo, kwe kuwa Amawanga gonna (abataafuna mukisa kubeera Kkanisa ya Katonda) Omukisa; Era Kristo (Omutwe n’Omubiri/ Ekkanisa) bakufuga wano ku Nsi oluvanyuma lw’okuzukira kw’Ekkanisa nga ebyawandiikibwa bwe bikakasa mu – Okubikk. 20:6 “Baweredwa omukisa abafu abalina omugabo mu kuzukkira kw’olubereberye, okufa okw’okubiri tekulina buyinza ku bbo, banabera ba Kabonna ba Katonda wamu ne Kuristo era banafugiranga wamu emyaka lukumi”. Okubikk. 5:9-10 “…………..n’atufuula ba Kabaka era ba Kabonna ba Katonda, era bakufuga ku Nsi”. Nti Kristo wa kufuga wano ku nsi nga ba Kabaka era Bakabonna okumala emyaka lukumi. Kino kya kubaawo oluvanyuma lw’okuzukkira era n’Embaga y’Omwana gw’Endiga. Obanga Ekkanisa (Omugole) ne Bba (Yesu) bakufuga nga Bakabonna ba Katonda ku nsi, kale banaba ba Kabonna ba nte oba mbuzi? nkoko oba misota? Kuba enjigiriza egamba nti ekkanisa egenda mu ggulu, abasigadewo mu geyena, kiraga nti tewali kigendererwa ky’okuyitibwa kwe Kkanisa! Ebyawandiikibwa bikakasa nti Ezadde oba Ekkanisa wamu ne Bba wayo bakuwa omukisa abantu bonna abalala mu nsi, kino kye kisubizo era omugaso gwe Zzadde lino. Bwe tusoma mu Kubikk.22:17 “Omwoyo n’Omugole bayita nti jjangu, n’awulira ayita nti jjangu, bwatyo alina enyotta atwale AMAZI ag’obulamu buwa”! Kino kikakasa nti oluvanyuma lw’embaga y’Omwana gw’Endiga, Abagole mbobi ba kuwa abantu Omukisa gw’okufuna obulamu obutagwawo, g’emazi og’obulamu. Bano tebayita nte oba mbuzi oba misota oba byenyanja nga engyigiriza enkyamu bweri nti abantu bonna bagenda mu geyeena abatasobola kugenda mu ggulu ! Wabula bayita bantu, kye kirayiro kya Katonda mu Olub. 22:18, ne Zzabuli 110:4 ! Kale amakkanisa oba abakkiriza bonna abalina ekigendererwa ekirara oba okuyitibwa okulala, kabonero akalaga nti tebaberanga mu Kkanisa ntufu songa n’omulyango oguyingira tebagulabanga nakatono !!! Kino, ky’ekiri nti essubi ly’okuyitibwa kw’Ekkanisa entufu liri limu! Mukama n’ayongeera n’alayira ku nsonga eno mu Zabuli 110:4 -- Nti Ekkanisa ne Bba wayo banabera Bakabonna ba Katonda eri abantu oluvanyuma lw’okuzukkira ! Mukama n’ategeeza nti mu dduke, mufulume amakkanisa ago gemuzudde nti tegali mu kuyitibwa kwa Mukama, nga ne baibuli egayita babuloni (bakavuyo kangi) – Okubikk.18:1-4 “….. kigudde kigudde ekibuga Babuloni, kuba kifuuse ekisulo kye ebinyonyi ebibi, ….. n’amawanga gonna ne gatamira omwenge gw’obwezi bwakyo….. Mukifulumemu abantu bange muleme okugabana ku mpera y’ekibi kyakyo”. Kale nga bwetulabye wagulu, kyetagisa okufuna n’okumanya amazima aga buli kintu okusinga engyigiriza entufu oba ey’amazima. Amazima Katonda yagawa okusobola okulongosa n’okutukuza abamukkiriza (Yokkana 17:17) era n’okutekebwako akabonero mu byenyi by’abakkiriza ne kumikono gyabwe! Wetwalire Omusomo gwa baibuli nga osomera ewuwo ate nga gwabwerere. Tutukirire ku ndagiriro eri Katabo kano! Mukama ategeeza mu Okubikk. 18:2-5 nti “ …. Babuloni kigudde .... mukifulumemu mwe abantu bange, …..” Kino kiraga embeera z’amakkanisa amangi agaava edda ku ngyigiriza ya Kristo ey’amazima era gy’eyaletawo (Yokaana 1:17). Laba, omubulizi w’enjiri nagamba nti omukkiriza gundi / omulokole gundi afude, agenze mu Ggulu! Wano n’asazamu engygiriza y’okuzuukira, kuba okuzuukira kwa wano ku nsi ate nga tewali kyawandikiibwa kigamba nti ba kudda ku nsi balyokke bazuukire – Yokaana 5:28-29; Isaaya 26:19; Olub. 3:19? Amakkanisa mangyi nnyo gavadda ku njiri ey’amazima n’ebadda ku ngyigiriza za masitani – 1 Tim. 4:1. N’ebikwolwa ebibi ebyongedde mu nsi gamba nga abakkiriza – Abasumba babwe abawagira ebisiyaga. Mukama kyava abagamba nti amadiini n’amakkanisa ago mu gaveemu. Tuwandiikire oba tukibire esimu osobole okuyambibwa nga oyiga baibuli – oyawule amazima n’obulimba, osalewo. — Eph. 3:11, Emp. Diag. OMUSOMO GWA BAIBULI nga gwabwerere! 1. Why does God permit Evil/ Satan to do injury? 2. The Most Holy Faith — the Faith which was delivered to all Saints. 3. The study of Bible Covenants. 5. The Armageddon & The End of the World. 6. Tongues, Miracles, Visions and Prophesying. 7. The TRUE Christian Baptism! Desiring to obtain God’s blessing but indifferent in doing His will results in failure. Serving and improving the life conditions of your fellow men towards God, is one source of God’s blessing. Therefore, desiring to spread God’s Message of life but thinking you are too busy with work of whatever sort, poor to give financial support as you may not have enough for food, or you are not talented to speak, or feeling bodily imperfection that a person may ask you what you can not explain; yes in whatever form of constraint: We advise you to consider the many and varied opportunities the LORD of heaven has placed before you to serve your fellow men and women; Example, obtain copies of this monthly Newsletter — look at People interested in God’s word around you; at work place, home, neighbors, at your church, sending a copy to mother, father, friends & relatives in different places of the Country. Those who could promote this work in other right way, the opportunity stands. Yes, how refreshing and motivating you may contribute to changing Peoples lives, and yourself be God’s righteous Servant in the belief of Christ and the TRUTH. Growth in faith is a desired state of Christian for desired fruitage of Christ likeness; But this must be in line with the will of God as expressed in 1 Thess. 5:21 KJV — “Prove all things; hold fast that which is good.” In line with this exhortation we advise all who are earnest students of Scriptures and our Newsletter, to prove all our studies with the only standard given by God (Isaiah 34:16) and please communicate to us! It is also, our privilege to share the message of God’s love with others; hence we advise those who received the first publications to share them with God’s People. The Editor, Christ’s Kingdom, P. O. Box 28734, Kampala, Uganda. Tel: (+256) 753 116202 / 0776 116 202. 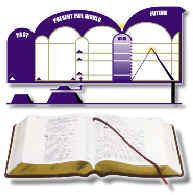 You can visit www.bibletoday.com for more on Bible studies.